Yoga is becoming ever more popular in the Western world, and its no wonder why. Regardless of what kind of class you take, it is a great way to get the blood flowing. You’re sure to get a deep stretch or a thorough workout, and when the class is over, you’ll feel relaxed and at peace. Here in Big Bear, yoga classes are easy to find. See below for a listing of the best places that offer sessions! 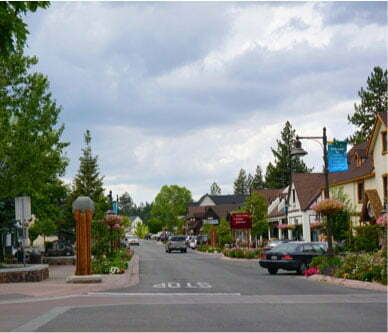 Let us help you plan your vacation to Big Bear! 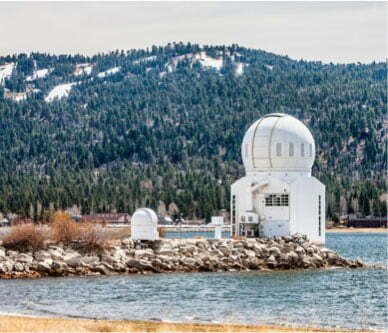 Download our complimentary Vacation Guide to discover other fun ways to exercise in Big Bear Lake, like hiking or swimming! One great aspect of yoga is how the types of yoga vary. If you’d rather have a calm, relaxing session, try yin yoga. If you want a workout, several variations challenge nearly any part of the body. And as long as there’s a flat surface large enough to accommodate a mat, you can practice yoga just about anywhere, whether in a studio or outside in the great outdoors. Big Bear yoga ranges from typical yoga to classes practiced on a mountain to the increasingly popular goat yoga, so there’s sure to be something for you! You too can have your chance at holding poses with adorable goats! Bear Valley Farms hosts goat yoga Saturday mornings at 8:30. There’s nothing quite like outdoor yoga in Big Bear, and when you add in the experience of baby goats jumping up and nibbling on you, it makes for an unforgettable memory. Make sure to register in advance to ensure you get a spot! Big Bear Yoga aims to foster a community beyond offering classes. They welcome people with all levels of expertise, so even if you’ve never done yoga before, there’s a class that will fit your comfort level. Take a session at the studio, or ask them to come to you! If you’re looking for a Big Bear yoga retreat, they can plan one for you. Looking for outdoor yoga in Big Bear? They cover that, too. If you happen to be visiting in October, be sure to attend the Big Bear Yoga Festival, which Big Bear Yoga organizes. Stretch and sweat as seasoned teachers guide you through poses while browsing vendor offerings between sessions. The Fitness Source boasts the title of the newest, largest gym in Big Bear Lake. They offer both hatha and vinyasa classes which cater to those looking for a more mellow experience as well as those looking to work up a sweat. You can find yoga on their schedule Saturdays and Mondays. This yoga studio offers a range of classes. Mountain Yoga Center is at the base of Snow Summit in Big Bear which makes for a picturesque backdrop. The studio itself exudes a relaxing, minimalistic atmosphere, perfect for meditation and yoga. Classes offered range from candlelight flow to power flow, and there’s even a kids yoga class! Be sure to check out Mountain Yoga’s schedule before you stop in to see everything that is happening. Extend the feeling of peace you acquire after your experience with yoga by staying with Big Bear Lakefront Cabins. 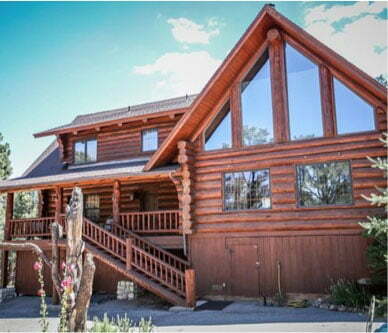 We have beautiful rustic cabins throughout Big Bear Lake, close to all the best attractions. Our properties feature luxurious amenities like hot tubs, private decks with incredible views, cozy fireplaces, and more! No matter which cabin you choose, it will be the perfect place to stay during your vacation here. 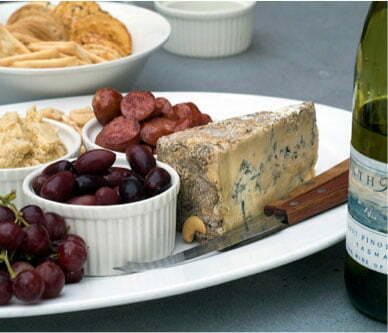 Our Bit of Heaven is fantastic for a family vacation or group of friends. It features beautiful vaulted pine ceilings, and one wall has floor-to-ceiling windows that let in the stunning views. Curl up in front of the fireplace with a glass of wine or soak in the hot tub on your private deck and gaze at the stars. There’s even a fenced-in backyard, so you can bring your four-legged friends along, too! This is just one of the elegant cabins that we offer. 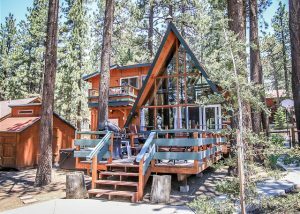 Be sure to browse all our cabin rentals, and book your stay in Big Bear Lake today! Laugh It up at the Big Bear Comedy Festival — What Is the Big Bear Turkey Trot?